A moving story of parents coming to terms with their baby's deafness. All emotions of hearing parents, such as love, hope, anxiety are expressed here with power and simplicity. 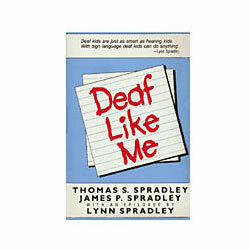 In the epilogue, Lynn Spradley as a teenager reflects upon being deaf, her education, her struggle to communicate, and the discovery that she was the focus of her father's and uncle's book. A wonderful book for everyone to read.